This was a 3 week individual project in my systems class, where I found someone suffering from a chronic disease or illness to interview and figure out how to help them treat their pain with sensors that can track anything. The person I interviewed suffered from hypermobility, a fancy term for being double-jointed that can be severe in certain cases. Through the research, I discovered that the main problem was the lack of understanding the doctor has about the patient’s pain. 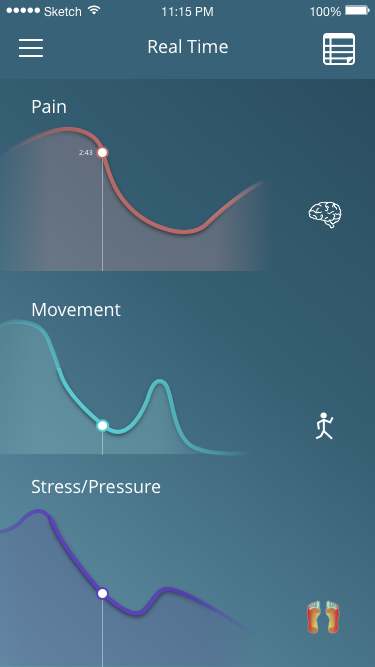 Due to that insight, my solution was to have the sensor track certain neurological signals in the brain that measure pain, and have it displayed in real time on a companion app. This page goes through the feedback loops and maps I created, informed from the research, as well as the visual design of the app. Taking the information gathered from the interview as well as the secondary research, a quick prototype of an app was created that would connect to the sensor embedded under the user's skin. This prototype was created within a week. The interviewee suffers from hypermobility, where the joints can extend beyond the normal range of motion. Her feet are in constant pain and she stated that her biggest problem is never receiving any effective help from her doctors. A feedback loop was created in order to understand where a new input could be created within the output, in order to help Melissa with her pain. Sketches of what the app could look like and the addition of possible products were done in order to figure out the best way of allowing the interviewee's pain to be communicated. With the addition of the sensor, which detects certain neurologic signatures in the brain, the use of the app allows the interviewee to keep track of her pain and offer accurate information to her doctor. With this app, it can be beneficial for anyone who has a chronic pain and is unable to communicate it effectively to their doctor. It provides context to any spikes they may have during the day and allows for direct contact with the doctor, without the need to make an appointment.